With the title of "the most important celebrity in sneaker culture," it&apos;s no surprise that Jerry Seinfeld designs NIKEiD kicks to match his favorite sports teams&apos; uniforms. 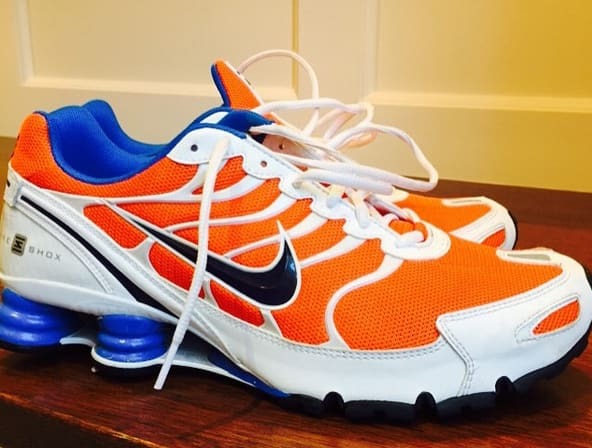 Seinfeld took to NIKEiD this past spring to create a New York Mets-inspired pair of Nike Shox Turbo VIs, that&apos;ll look even better now that the Mets are in the MLB playoffs, which start this week. Seinfeld posted these sneakers on Instagram a little while back and said, "I made these on Nikeid in the Spring for Mets &apos;15. Working like a charm so far.."
It&apos;s no surprise that Seinfeld mad these, really. He loves Shox and the Mets. Sports fans can be superstitious, especially when it comes to the gear they wear, so him viewing this pair as a good luck charm isn&apos;t that farfetched. We&apos;re sure all Mets fans are hoping that he continues to wear these during the playoffs, and if they continue to win, we bet Nike will get a few more orders for this colorway. You can make your own pair for $165 at Nike.com.